The mysteries of heaven are opening... I finally know where the Golden Plates are! Thanks goes out to Lyndon Lamborn for mentioning it in his "Mormon_Problems" document. The answer is hidden in Brigham Young's Journal of Discourses, volume 19, pages 39-40. "I lived right in the country where the plates were found from which the Book of Mormon was translated, and I know a great many things pertaining to that country. I believe I will take the liberty to tell you of another circumstance that will be as marvelous as anything can be. This is an incident in the life of Oliver Cowdery, but he did not take the liberty of telling such things in meeting as I take. I tell these things to you, and I have a motive for doing so. I want to carry them to the ears of my brethren and sisters, and to the children also, that they may grow to an understanding of some things that seem to be entirely hidden from the human family. Oliver Cowdery went with the Prophet Joseph when he deposited these plates. Joseph did not translate all of the plates; there was a portion of them sealed, which you can learn from the Book of Doctrine and Covenants. When Joseph got the plates, the angel instructed him to carry them back to the hill Cumorah, which he did. Oliver says that when Joseph and Oliver went there, the hill opened, and they walked into a cave, in which there was a large and spacious room. He says he did not think, at the time, whether they had the light of the sun or artificial light; but that it was just as light as day. They laid the plates on a table; it was a large table that stood in the room. Under this table there was a pile of plates as much as two feet high, and there were altogether in this room more plates than probably many wagon loads; they were piled up in the corners and along the walls. The first time they went there the sword of Laban hung upon the wall; but when they went again it had been taken down and laid upon the table across the gold plates; it was unsheathed, and on it was written these words: "This sword will never be sheathed again until the kingdoms of this world become the kingdom of our God and his Christ."" I had no idea that the hill Cumorah opened up and Joseph Smith and Oliver Cowdery walked right in a gave the plates back to the hill. Sounds like a plausible enough story to me. 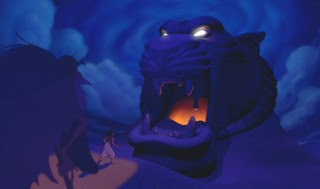 I mean, if I could beleive that angels visited Joseph so many times, why couldn't a hill act out a scene from Disney's Aladdin? This presents a few issues for me... mainly, why hadn't I heard about this at Church? Why doesn't anyone talk about it? Its right there in the writings of Brigham Young so shouldn't we know this story by heart? What about all of the speculation that an angel came down and gathered up the plates so that they couldn't be defiled by man? Is that explanation a lie? Am I supposed to take Brigham Young's words at face value? Should I not listen to the prophet like so many apologetics tell us? This also brings up another problem I have with the church... why is it that I have to learn about the church's own history, the very church I belong to, from sources that the church tells me is anti-mormon and which I should stay away from, quoting the very documents that our beloved prophets wrote themselves? Thats the interesting thing about religion in general. You can't say "lets go dig it up" becuase obviously God doesn't want us to find it. It requires us to use faith instead of real evidence, which seems to be the only basis for following any church that I can find. Wow, I read something new every day. Thank you for posting this story. The idea of a "Cave of Wonders" is the most ridiculous thing I have heard yet. Now, if I read that right, he said that they went there more then once but never bothered to mention it to anyone but Brigham. I can't even come close to buying that one. Sometimes I think Brigham Young just said whatever he wanted to, the more outrageous the better. When I was a wee lad, growing up in northern Utah, I'd somehow made the connection between Golden Plates and Golden Arches. The Gospel was everywhere and so were McDonalds. It all made perfect sense at the time. Soy Yo, the problem, as I see it, with a lot of the things that BY said is that either we beleive what he says becuase he's a prophet, or we have to discount all of what he said because he was not. I'm sure there may be some "philosophies of men mingled with scripture" in there, but how are you supposed to know which is which? I think it takes a great deal of work to filter through all of that. Sideon, I think we would all like to think Micky D's is divine, but I know what you're saying... precept upon precept. Hell. Now we know where they went! This is not taught any more, at least I don't think so. I could be wrong. Everyone knows BK is better than Mickey D's. And that the church is screwed if we apply their own logic to them. They can't function if we do. Your right about Bk. Your also right about applying logic to the church. It just doesn't make any sense, especially after you look at it without your blinders on.